Welcome to the brave new world of blockchain. Some say it’s the future lifeblood of the internet and commerce. It will provide the foundation of the most robust information security system ever created. It will allow access to economic tools currently unavailable to billions. You may have seen many articles on blockchain recently. Maybe you’ve never heard of blockchain. Or maybe all you’ve heard about it is the hype. But what’s a blockchain? The short explanation: It’s a network-based tool for storing information securely and permanently. The information in a blockchain can be authenticated by members of the public, but the information can be accessed only by those who have permission. 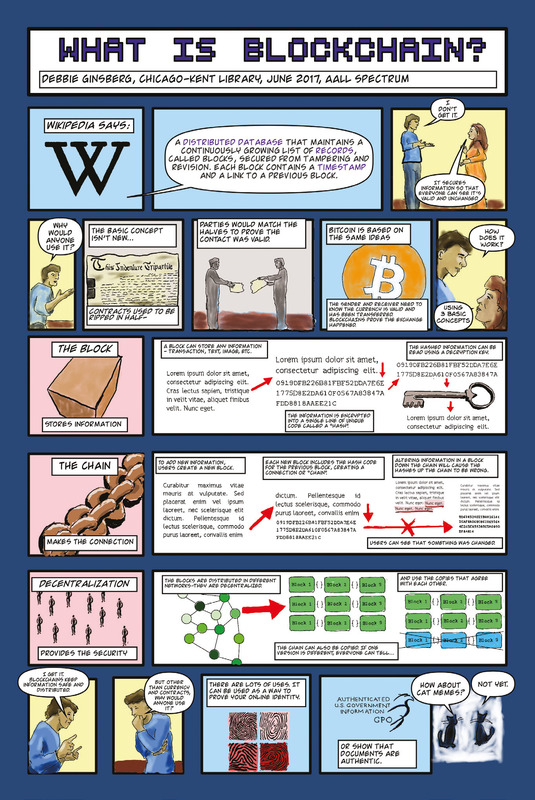 Blockchains can take any information—from simple ledgers to complex contracts—and store it in online containers called “blocks.” These blocks are then encrypted, meaning that the information is translated into a unique series of letters and numbers called the “hash.” The hash is created using a special encryption key. Only users who have the key can read the information. The blocks are then linked together. Each block’s information includes the hash of the previous block in the chain, along with a time stamp. For example, a hash might look like this: 00002fg5d5500aae9046ff80cccefa. The tools that create hashes use sophisticated cryptographic calculations so that each hash in a particular chain will start with a set of standard characters, such as 0000. How does this keep information secure? The blocks are “decentralized,” meaning that different blocks are stored on different computers, creating a distributed network of information. This network is public, so members of the public can see the chain and read the hashes. Changing the information in any block changes its hash. This change then moves up the chain, changing their hashes as well. The hashes in blocks that are further up the chain will no longer start with the standard characters. For example, they won’t start with 0000 and the time stamp will have changed. That means anyone can now see that data in the chain has been compromised. Some blockchains are single chains, but many blockchains work by distributing copies of the whole chain in the decentralized network. If the copies don’t agree with one another, the blockchain’s users will elect to accept only those chains that match, and will discard any compromised chains. Keep reading after the comic below. If you’ve heard of blockchain, it’s probably in relation to Bitcoin, an online currency that is recorded in a blockchain. Bitcoin isn’t issued by a government or bank; instead, it is created through sophisticated mathematical algorithms and distributed over a large network. Bitcoin’s popularity stems from two features not available in most other monetary transactions. First, no intermediary, such as a bank or PayPal, is needed. These intermediaries often take a hefty fee, particularly in international transactions. Users can transfer money directly to each other, and the parties don’t need to trust each other. By using Bitcoin’s blockchain, the parties know their transaction is secure. Second, no copies of the funds are made—as happens in many online transactions—so the funds cannot be “double spent.” The records in the chain containing Bitcoin funds simply point to a new (anonymous) owner when a transaction is made. While many praise Bitcoin’s anonymity, this trait has given the online currency a somewhat shady reputation. Many ransomware viruses demand that payments be made in Bitcoin. Often, users affected by these viruses don’t know what Bitcoin is, let alone where to buy it. The currency is sold in special online exchanges. The financial industry has been investing in blockchain. Some of this investment has been outside the mainstream financial sector. For example, there are now several hundred Bitcoin-type currencies known as cryptocurrencies. A few of these, such as Ethereum and Ripple.com, have been gaining ground on Bitcoin. They may eventually take over a significant part of the cryptocurrency market. Major financial companies such as JP Morgan Chase are investing in their own blockchain-based applications. However, these applications will likely work somewhat differently than cryptocurrencies. Bitcoin and other online currencies use public blockchains, meaning that some information about the chain can be viewed by anyone. Visitors to Blockchain.info may access any block on the Bitcoin public blockchain. However, information about who owns the currency and how to access it is not public. Instead, large financial companies are investing in private blockchains. Companies have full control over these blockchains because they are not distributed publicly. The companies themselves control the blockchain network. However, private blockchains might be more vulnerable to hackers because they aren’t distributed as widely as the public chains. In addition, blockchain now plays a role in distributing intellectual property. For example, Resonate.is uses a blockchain system to manage a music cooperative. Similarly, DotBlockchainMusic.com is using blockchain to create a media file platform that embeds digital rights management. Even Walmart is experimenting with blockchain to better track products from farms and factories to shelves. Just as artificial intelligence (AI) has already affected how legal work is done, blockchain also offers several ways to automate and outsource legal processes. Smart contracts have generated the most discussion. These contracts are coded into blockchains and make contract execution work more smoothly. First, there is only one copy of the contract and all parties have access to it. The contract is completely transparent, and the terms of the contract are coded into the blockchain. It is therefore impossible to create fraudulent or inaccurate copies of the contract because the terms can’t be changed without the agreement of all parties to the contract. Second, the smart contract can be configured to be self-executing. That is, verifiable events trigger the next stage of the contract. Proof of those events can be added to the chain. For example, Widgette Co. agrees to sell Acme Co. 100 widgets for $1,000 and ship them one week after payment. When Widgette Co. produces the 100 widgets, its system adds this information to the blockchain with a time stamp. Acme Co:s system pays $1,000 and adds that information to the chain, also with a time stamp. Widgette Co. then ships the widgets, and that time-stamped information is added. Finally, Acme Co. records when it receives the widgets. The blockchain can even include a dispute resolution mechanism. If a problem arises—such as Acme Co. claims that Widgette Co. shipped the widgets after two weeks instead of one week—this information can be verified by reviewing the information in the blockchain. The chain can then arbitrate the dispute based on preset terms. For example, Acme Co. automatically receives a 1 percent refund for each additional week that shipping is delayed. The legal possibilities are not limited to contracts. Lawyers have been considering smart wills that can execute themselves, thereby avoiding probate. Blockchain could also be used in real estate transactions to help avoid using third parties in each transaction. For example, a blockchain real estate transaction wouldn’t need the services of an escrow firm. Governments have started to take notice of the possibilities that blockchain offers. Arizona’s governor recently signed an amendment to Title 44, Chapter 26. This amendment allows use of blockchain technology in the state, declaring that “(a] signature that is secured through blockchain technology is considered to be in an electronic form and to be an electronic signature” and “[a] record or contract that is secured through blockchain technology is considered to be in an electronic form and to be an electronic record.” Vermont is also working on a bill to allow the use of blockchain technology. Other governments and organizations, including the European Union, are investigating blockchain’s possibilities. The Republic of Georgia uses blockchain to secure government transactions involving property. Other governments are considering following suit, including those in Sweden, Honduras, and Cook County, Illinois. Are blockchains useful only for financial transactions? Absolutely not. Educational institutions are considering putting transcripts and graduation credentials on blockchains. This would permit alumni to easily access their own information and verify its authenticity. It would also help those students who enroll in classes at different universities to pull their information together into a single source. The Massachusetts Institute of Technology already offers blockchain-based certificates for some programs. Despite the many possibilities blockchain offers, before being widely implemented, it must first overcome several issues. There are already existing systems and regulations in place for many problems that blockchain could solve. For example, there has been discussion of using blockchain for health records, yet the current regulatory environment for these records would make creating a new system difficult. Blockchains are also not easy to implement. Setting up a blockchain requires sophisticated technology skills. Lawyers— particularly lawyers working with self-executing contracts—would need to work with coders to create them. That said, the use of blockchain will most likely continue to grow, particularly to solve problems involving security and authentication. One area that offers great possibility is using blockchains to create secure online identities that could be used to access online services and password-protected websites. New approaches are needed to prevent ID and data theft, and the blockchain may be just the tool for the job. This article was originally published in the September/October 2017 [Volume 22, Number 1] issue of AALL Spectrum. 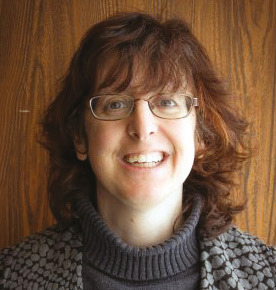 Debbie Ginsberg is the Educational Technology Librarian at the Chicago-Kent College of Law Library.